Early breakfast and after, leave Ndarara to Letukuni; the walk will take you 5-6 hrs through the scattered bushes. Dinner and overnight at Morinjo camp site. As in day 2, leave Letukuni camp early in the morning for an enjoyable walk before the sun is too hot. We will pass nosora for lunch or to buy what might be out of stock. After spending an hour or 2 in this modern town in massai land, proceed to the Morinjo for Dinner and overnight at the morinjo campsite. After breakfast, leave Morinjo. 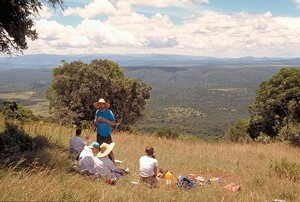 Walk through the forest; this is one of the few remaining true-forested wilderness areas in East Africa. The walk will take you 5-6 hrs. Dinner and overnight at Enkutoto camp site. 1.We leave Enkutoto early in the morning passing along the side of the Rift Valley via Nguruman town for Dinner and overnight at a local hotel. After breakfast descend down the escarpment and through small farms to Nguruman town for transfer back to Nairobi via Lake magandi and the Olorgasaile prehistoric site so as to arrive in Nairobi late afternoon.